We are a family-run independent paint manufacturer based in Lancashire. We are committed producers of premium quality, environmentally responsible paints, and other decorating products. We have been in the Manufacturing and Decorating Industry for many years. Although we have always been environmentally aware, it was not until we started to have our families that we became more mindful of the environmental damage being done to our planet and its population. When we bought these small people into the world we began to increasingly notice all the ‘nasties' in that existed in everything, from foods, packaging, carpets, vehicles... the list goes on. We realised that although we cannot directly change the other things, except to avoid them or to lobby against them, we could, however, actually do something to reduce the environmental impact of our own product range. We also take a very unique approach to helping you choose the best colour scheme for your home. We do not normally do ‘wet' samples of our paint as it is not cost effective, nor friendly to the environment. We do not like the thought of adding more plastic waste in the guise of small paint pot. These tend to be quite expensive to buy and then end up sitting on garage shelves for years before ending up in landfill. So rather than purchasing sample pots which leave your decor covered in a multitude of colours, making your room resemble a patchwork quilt, which then needs to be painted over (sometimes more than once) we like to do things a little differently. At Victory Colours we provide hand-painted sample panels in your chosen colour/s. These can be easily fixed on your walls without ruining your current decor. We recommend that you place the sample panels on different walls within the room over a period of time, as the pigments of colour within the the paint reflect light differently depending on time of day, or the type of light - whether natural or artificial. The sample panels give you an opportunity to experiment with how different shades and colours will look together. It is also a portable and easy way to match to fabrics and soft furnishings. They are A5 in size and small enough to fit into a handbag but large enough to get a true perspective of the colour. Here at Victory Colours HQ we know the importance of colour and how important it is to get the right paints for your home. Although we offer a beautiful palette of paint colours for your home we won't be offended if you would like something different. The colour spectrum is practically limitless as are the combinations of colours, therefore, if you can give us a paint colour reference or a sample which you need matching we will do our very best to match it for you. Obviously this will take a couple of extra days from receipt of the sample but we will endeavour to freshly mix your beautiful matched paint within 1-3 working days at no extra cost than our regular colours. We resolved to use packaging that was either recycled, recyclable and used sustainable products. We use innovative products made from waste material or by-products from other manufacturing processes, or ecologically sustainable sources. Paint Tins: We decided to use metal tins rather than rely on plastic containers for three main reasons: the first being that they are more robust for transporting and storing paint; the second that our tins are part recycled, and able to be recycled; thirdly that we wish to minimise the terrible impact of plastic on the environment. Although the containers we would have chosen would be recyclable, many would still have ended up in landfill which would be detrimental to the soil toxicity. Our paint formulation is a closely guarded secret. There is an exact science to combining the finest quality eco conscious ingredients, whilst at the same time having great durability and opacity! We use unique and exceptional pigments to achieve our fantastic depth and colour. Our paint is safe as possible for humans, and animals, with low odour and minimal contributions to the atmosphere. We offer a Colour Collection of 48 beautiful up-to-date hues in muted neutrals and modern brights. We are however, more than happy to colour match any colour of your choice as long as we have a colour reference. Victory Colours eco conscious paint has a technically advanced formulation which gives outstanding resistance to stains, which if you have mucky kids like ours, you need as much stain resistance as possible! The same goes for the washability of our paint. It has great wipe-ability properties which is perfect for young families or households with pets. Our paint also holds its colour and has excellent lightfastness i.e. it does not fade in direct sunlight. Our paint opacity is high which gives greater coverage, meaning that theoretically you need to use less of it which offers a financial (and time!) saving. We already made water-based paint, but we decided that we wanted to produce a premium quality, technically superior product which contained the best ingredients available, whilst stringently avoiding a whole host of unpleasant toxins including solvents, VOCs and phthalates, formaldehyde, and alkylphenol ethoxylates (APEO) amongst other things (there will always be trace elements of VOC sneaking their way in somehow but we are eliminating them every step of the way). So then what are VOCs? It is the term that everyone is talking about but nobody really seems to know what it means. In simple terms VOCs are Volatile Organic Compounds which are materials which evaporate readily from many common sources such as exhaust fumes, cleaning products, and within the Coatings Industry, paints, stains, thinners and brush cleaners. When in sunlight or direct heat, such as radiators, VOCs can ‘react with nitrogen oxides to create ground level ozone and photochemical smogs' (http://www.coatings.org.uk). This process can contribute to atmospheric pollution, so as you can imagine products containing VOCs are not the ideal to be breathing in on a daily basis. "A philosophy and way of living which seeks to exclude-as far as is possible and practicable-all forms of exploitation of, and cruelty to, animals for food, clothing or any other purpose; and by extension, promotes the development and use of animal-free alternatives for the benefit of humans, animals and the environment..."
These days it is hard to find products which don't have animal products within them, or have been tested on animals: from foods; make up and cosmetics; clothing; and even paints believe it or not. Luckily there are plenty of easily sourced alternative products which not only affordable but kinder on the animals which share our planet. You will be pleased to know that all of Victory Colours paints are totally vegan and do not contain any animal products, nor have they been tested on animals - EVER! If you are looking for truly vegan emulsion for your home, you can be assured that Victory Colours paints are animal and cruelty-free! Terms: The code 3For2 can be used as many times as you like for all paint colours. Applies only to the paint collection. The cheapest product will be free. This offer does not work in conjunction with any other offers. 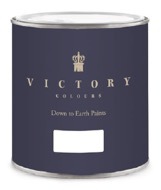 Victory Colours eco paint is a non-toxic, ultra low odour premium paint with virtually no VOC's and toxins that can emit years after drying. This tough, yet beautiful, intelligent emulsion is robust, durable, wipeable has great opacity & coverage. I have tested Victory Colours emulsion. It is very good! It is a solid, robust, easy to use/apply product. The quality of the ingredients is very apparent to me. I take 'endorsement' and 'recommendation' seriously - I wouldn't put my name behind anything that wasn't genuinely good. I know what's good and isn't with paint, and Victory IS good stuff. Paul Dyer, Carlton Decorators.